I have been quite remiss in posting lately. Let me just say that the holiday season left me very very busy. I should have posted this recipe long before now. This is one of the family’s favorites and a recipe I make quite frequently. On Christmas Eve in West Texas especially along the border, it is traditional to have tamales and beans. After we ate we would go for a drive to look at all the luminarias. Entire neighborhoods were lined in luminarias and they were so beautiful. This year we had tamales and beans but I unfortunately did not see any luminarias as they are not a common thing to see in this area. 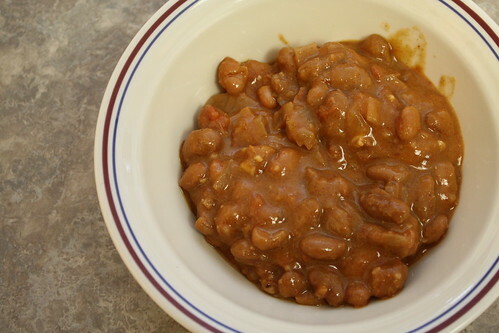 Put soaked and drained beans into slow cookers. Add water and all remaining ingredients. Cook and cover on High 2 hours, then turn to Low for 8 hours. I also like to serve this with cornbread. Posted on December 28, 2012 by cookingwithpizazzPosted in Crockpot, VegetableTagged Food, Recipe, side dish, Slow Cooker.